A new collaborative theater project tells the story of six mothers from different ethnic backgrounds and traditions, across generations, and how they juggle their numerous identities as care-giver, teacher, parent, worker, and leader. 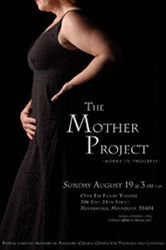 This new work, called "The Mother Project" will have a "raw" staging at Michael Sommer’s Open Eye Figure Theatre, 506 East 24th St., Minneapolis, on Sunday, Aug. 19 at 3 p.m.
"The Mother Project" was created through a collaborative process lead by Darcey Engen, assistant professor of theatre arts at Augsburg College. The six mothers, Jeany Parks, Nanci Olesen, Darcey Engen, Maria Asp, Sonny Case, and Erin Carlson Sutton, began to create the new work through writing exercises accounting their individual journeys through motherhood. According to Engen, these women were drawn to "The Mother Project" because they had each grown restless trying to find a place where their experiences were told. Motherhood is seldom described as central narrative in literature, television, dramatic literature or cinema. "The Mother Project" begins to address that deficit. Tickets are $8. Free parking in the southeast lot at Portland and East 24th St. For more information call: 612-330-1549.